This album starts with the execution of three murderers. Richard Del Connor became a Mason in 2007 and was raised to the 3rd Degree of "Master Mason" in 2009 at Burbank Masonic Lodge #406. On June 9 of 2009, Richard was practicing for his 3rd degree proficiency so he could enter Freemason politics. He discovered that one of his Kung Fu forms from China was encoded with all the secrets of British freemasonry. Download entire L4 Part 2 album now! 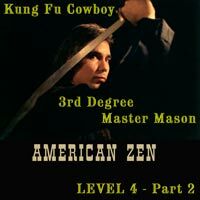 Our Coyote's lifestyles merge together in the KUNG FU COWBOY series of albums. Coyote, a.k.a. "Buddha Zhen," has just founded the Buddha Kung Fu schools in Montrose, California. 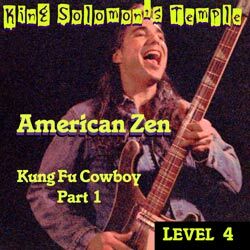 Check out "KILL THE SPIDER" from the LEVEL 1 = King Solomon's Temple album by American Zen. Download entire L4 Part 1 album now! 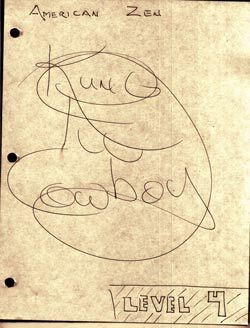 This handwritten rough draft was released February 4, 2009. Debut album of Buddha Zhen. Founder of Shaolin Chi Mantis Tradtional Buddhist Gongfu 1992. 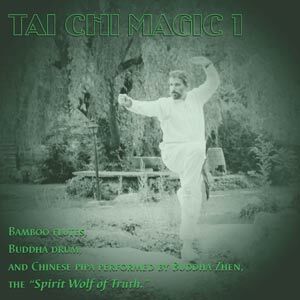 Founder of Tai Chi Youth nonprofit organization 1996. Founder of Buddha Kung Fu 2008. Founder of Shaolin Zen, an American sect of Chinese Chan Buddhism. 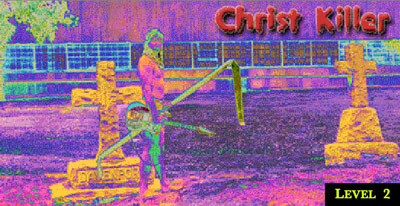 This album was originally recorded in 1994 on a 4-track recorder, then upgraded to 32-track digital in 2007. Drums, more Chinese pipas, more flutes, and digital enhancements were added. Be inspired with inspiring music. Order directly from Shaolin Records. Order directly from Shaolin Records and save money. "America's First Buddhist Rock Band!" (Church of Jesus Christ of Latter Day Saints).